On the archaeological site at L'Anse aux Meadows National Historic Site in Newfoundland, Canada, visitors can view the reconstructed Long House. 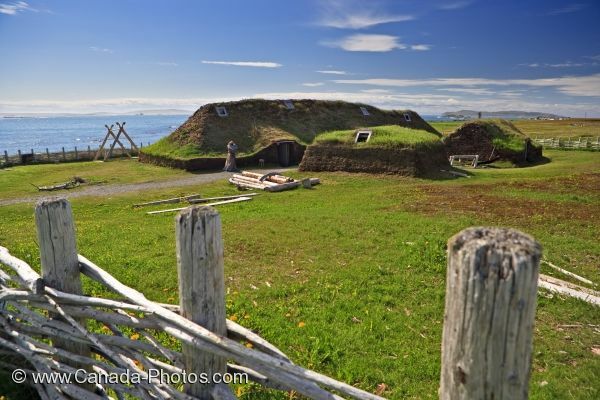 The reconstructed Long House at L'Anse aux Meadows National Historic Site in Western Newfoundland, Canada is just one of the fascinating features tourists can see while visiting here. The Long House, along with other buildings and details of Viking lifestyle as well as hiking trails to the bays and lakes can all be explored while visiting L'Anse aux Meadows National Historic Site. Reconstructed Long house at L'Anse aux Meadows National Historic Site of Canada and UNESCO World Heritage Site, Northern Peninsula, Great Northern Peninsula, Viking Trail, Trails to the Vikings, Newfoundland, Newfoundland Labrador, Canada. Picture of a reconstructed Long House at the L'Anse aux Meadows National Historic Site in Newfoundland, Canada.